Do you find it difficult to search for a job these days..?? Certainly, it is difficult to find a new job even if you are well qualified but what if you don’t make the right use of the opportunities that are available. 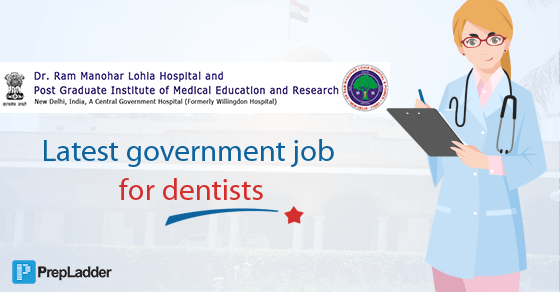 Dr. Ram Manohar Lohia Hospital, New Delhi invites applications from Indian National in the Prescribed form (Annexure- I) for the post of Junior Residents (Dental) for two batches of six-month duration each, starting in August/ September-2018 and February/ March-2019. The total number of posts is 8 in each batch. The reservation of posts will be as per 200 point Roster. Vacancies may increase or decrease at the time of selection. The number of vacancies indicated as above is provisional & 1 seat is reserved for PwD (Ortho) candidates. Pay scale- Rs. 56100- 177500/- plus applicable admissible allowances in the pay matrix (level 10) under CCS (Revised Pay) Rules, 2016 at entry level. Only those candidates who have completed/ likely to complete Internship by 30 June 2018 may apply. The candidates who have completed the Internship before 30 June 2016 are not eligible and hence need not apply. Candidates who already done/ dong six months/ more than 6 months Jr. Residency is not eligible to apply. Not exceeding 30 years of UR (relaxable by 5 years for SC/ST, 3 years for OBC) as on 30 July 2018. The Medical Superintendent, (Central Diary and Dispatch Section, Near Gate No.1), Dr. Ram Manohar Lohia Hospital, New Delhi latest by 30 July 2018 till 4:00PM. (ii) The selection will be based on the written examination. (iii) DDC/DCI Certificate is mandatory at the time of joining. (iv) OBC candidates are strictly instructed to submit the OBC certificate as per given annexure-II.